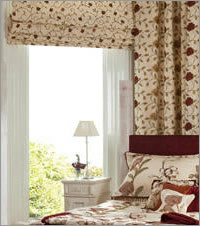 If you are looking for luxury roman blinds online and you are not too sure what will best suit your décor or fit your bay window or French window perfectly then look no further than our stunning collection of contemporary designer roman fabrics. These gorgeous soft fabrics will blend in seamlessly to either an ultra-modern design masterpiece as well as the more traditional of homes. All the fabrics used in our quality made to measure roman blinds are sourced from designer fabric companies such as Romo and Prestigious Textiles so you can be sure of the quality and design credentials. 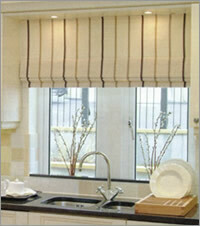 So rather than wondering how to make roman blinds? 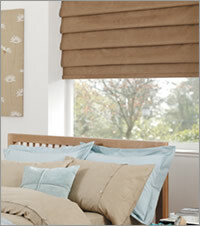 We are here to offer you high quality and very sumptuous blinds at discount online prices saving you both time and money. The only thing cheap about these fabulous shades is the prices. They are quality made to measure blinds that are hand made to the highest standards using only the finest components and fabrics available. 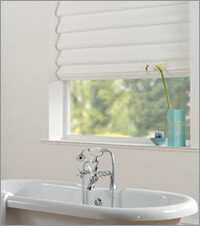 Ideal for creating the look you require at affordable prices. So if you are looking to buy roman blinds online then take a look at our simply fabulous luxury selection and order some free fabric samples. Maybe a particular room you are looking to adorn with one of our luxury romans and add some opulence and design to requires the additional benefits of blackout lining for that extra light control such as the bedroom or a living room that gets a lot of sunlight during the daytime. Then our practical blackout roman blinds are available with a no cost blackout lining option within our range of fabulously funky and contemporary fabrics in floral patterned designs and plain fabric colours. 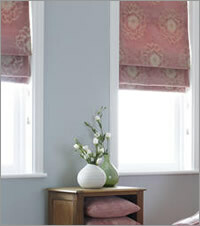 Whatever room of your home you are looking to adorn with our stunning fabric blinds, whether it’s the living room, dining room, kitchen or bathroom, our contemporary patterned roman blinds will bring a wonderfully sumptuous look and feel, creating the most dramatic, elegant and luxurious backdrop at any window. 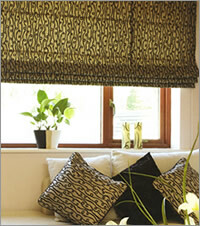 Enabling you to extend your interior design ideas through to the windows. 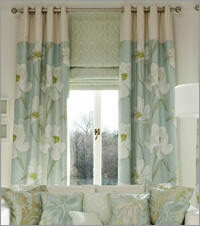 From modern to traditional, these contemporary designer fabrics will grace any home with their quality and style. Choose from very beautiful bold floral patterned fabrics that are both striking and modern and incorporate wonderfully pretty leaves, flowers and blooms, or some extremely colourful and funky printed designs to add a twist of colour and uniqueness to the room’s décor. Of course there are the more traditional and classic fabric designs that offer a wonderfully tranquil and sophisticated look. With such a gorgeous collection of luxury soft fabrics to choose from in a beautiful array of colours, it is easy to find the perfect made to measure roman blinds to compliment your interior décor in the most fabulous way. From funky and contemporary colours such as bright pink, lime green, orange red and blue to more classical cool white and dramatic black, there is a fabric colour available to buy online that will suit any homes colour scheme. 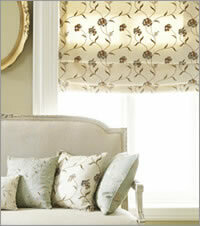 Whether standard or blackout lined our simply gorgeous luxury fabric blinds will add beauty and elegance to any room. All you have to do is simply choose your fabric and place an order. 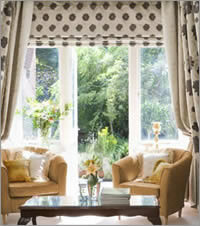 Fabric: Very high quality fabrics from designers such as Prestigious Textiles & Romo Fabrics. Lining: Fully lined as standard with blackout lining as an option. 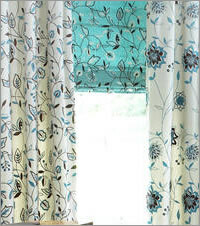 Fabric Join: All blinds wider than 120cm wide will use more than one fabric width and will therefore have a fully stitched seam. Manufacture: Our stunning romans are all hand made using only the finest fabrics and components to create a very luxurious and timeless window treatment. Finish: Fully stitched all round with the support rods sewn in for perfect folds every time. Control: Choice of left hand or right hand controls. Operation: Cord lock lift control or optional endless chain sidewinder control. Fixings: Supplied with all the necessary brackets & screws for top and face fixing.